Chapters From My Life: Why will Janaki not eat Chicken? 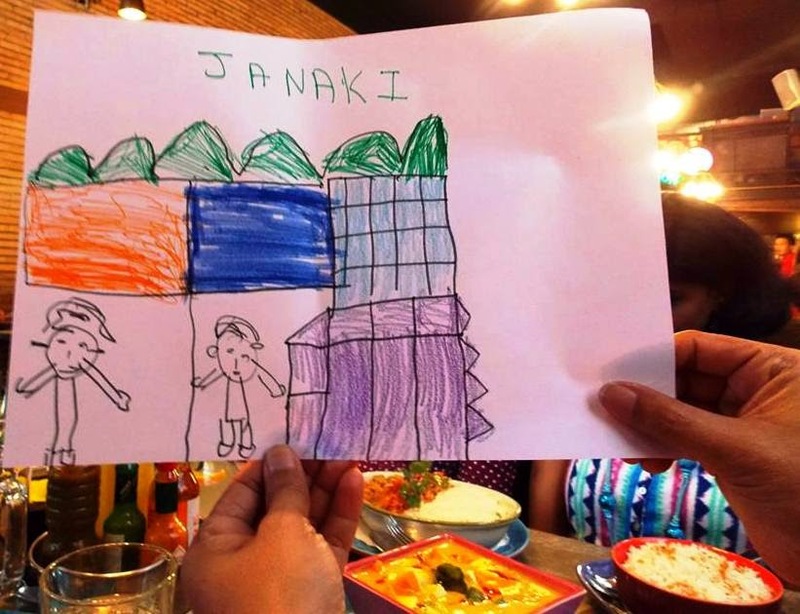 Why will Janaki not eat Chicken? You need not agree on everything to be friends! · She never complains that she is bored when we are chatting away, but silently observes all of us to give her opinion later. · She enjoys the little (or more) attention she gets from my friends. 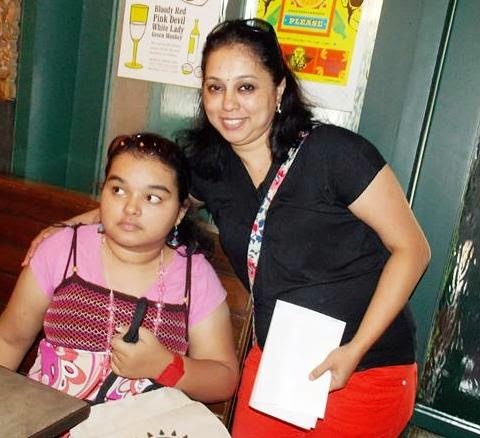 · Being a special needs girl, she lacks a friend circle or social life of her own. So, this is the closest she can get to it. · She is dignified, well behaved, not demanding and silent when she is in a social gathering. That is her alter personality which is completely opposite of what she is at home. · She learns many new things when she is out with me, most of them positive. Ahem! Yesterday, I met with fellow bloggers and wonderful women –Monika, Janaki, Rachna, Indrani, Asha and Afshan. As usual Farheena was tagged along. She came with beautiful paintings to give away to whoever said she is pretty. This is Farheena's gift for Janaki, her facebook friend. She sat there silently watching us as we ate our food and chatted away.There was this freak of a dish called Salmon Khan and while discussing the dish, we ended up with discussion about vegetarians and non-vegetarians. Janaki explained that she was vegetarian by birth and does not even eat eggs. I did not expect Farheena to get interested in this conversation, but she was. After all we were discussing about chicken which is more interesting topic for her than the Modi-Rahul-Kejriwal talk. As soon as she came home, a message was sent to Janaki, inviting her to eat chicken or something like that through her facebook. This is one of those kind souls who try to keep in touch with Farheena on Facebook and put up with her bombardment of Hi’s. The lady said, “I don’t eat chicken, ask your Maa why?” and Farheena came to me with the iPad and showed me her message. Now, I was in a very sticky situation. I had tough time explaining to her why Deewali is celebrated, why people worship cow, why people sacrifice goats/sheep, why some women wear burkha whereas others do not etc. Those are the days when I realize that we humans have become so complicated that we cannot understand our ways with basic knowledge required for survival. We need to understand the complicated things with a far highly complicated mind which unfortunately (or fortunately) Farheena doesn’t possess. I tried to escape by telling Farheena that I had some work to catch up and I could not answer her questions right now. So, she waited patiently until I hit the bed and brought the topic up once again. Sigh! This is how our conversation went. Why Janaki doesn’t eat chicken? She doesn’t eat chicken because she is a vegetarian? She eats vegetables in the morning, afternoon and night? Many people do not like chicken, like you don’t like vegetables. But you said they cannot eat chicken. Why? Why Rama and Buddha are bad? No no no… they are not bad. They don’t want people to eat chicken. That’s all. That means they are bad (that was final verdict). They are also responsible for people bursting crackers and giving me headache? And they are also responsible for people who worship cows on street and scare me? Janaki is one of those people? I know now Janaki is not very smart, but she is my friend, she is nice and I like her. So there, if you are not a complicated person you can openly love another human being who you find weird, different from you and do not agree with. I wish I could get where she is! Hahaha....you have immense patience Farida...hats off for that. Glad I hooked her on to you instead of explaining it myself. :) One day I will come up with conversations with Farheena...wish I could answer all her why's. I developed the patience answering to all the why's of my little brother back in my childhood. Came handy now. Rayyan can have similar conversations with me most of the times as well LOL. I am sorry I did not explain to her that you were smart woman. Was too sleepy for that. There is so much innocence as well as depth in her thoughts! Love this conversation! Glad to see you here Radha. I think it is not dept but simplicity that we need in our lives now. That is something Farheena has. How sweet of Farheena! The doubts that arose in her mind are genuine. She will understand when she grows up. I am charmed by her innocence. Thanks Ritu. But this profoundness is often found in our home because there is no other way I could get her off my back. wow such a long conversation and I loved the ending how she said --- "but she is my friend, she is nice and I like her." Thats what matters is n't it. Enjoyed reading this. My love to Farheena ! That sentence hit me hard as well Afshan. I struggle to love people who may clash with my views. Very innocent questions from a good soul and equally concerned and wise reply from a great mum! Ps. Hello - How are you mam. Long time. Its tough to explain such things to kids right. I as a small kid had a tough time understanding these differences. Aww ....their innocent minds have so many questions...all we require is unending patience from our side to explain them :)It's not that she is a special needs kid, you are finding it difficulty...I have hard time explaining these stuff to my kids as well...they are sensitive topics. i have visited ur blogs before when i was in Chennai. Was off blogs but now i'm back again. Glad through here and there i found you again. In this post of urs i have again learnt...children can put forth questions...and we must answer them correctly to the best without clouding them with prejudices and biases. U did well and i wonder what i would've done. Simplicity at it's best. pls visit me sometime too Farida Rizwan.